NEW DELHI: India has made it clear that there is no question of it joining the Nuclear Non-Proliferation Treaty (NPT) as a non-nuclear weapon state while reaffirming its commitment to check further proliferation of atomic weapons. India also reiterated its stand of "no first use" of nuclear weapons and not targeting non-nuclear weapons states and offered to enter into agreements incorporating the two principles. "As a responsible nuclear power India has a policy of credible minimum deterrence based on a No First Use posture and non-use of nuclear weapons against non- nuclear weapon states," Ambassador D B Venkatesh Varma said. Varma, India's Permanent Representative to the Conference on Disarmament, was speaking at a meeting of the UN General Assembly Committee on Disarmament and International Peace here on Monday. "We are prepared to covert these into bilateral or multilateral legally binding arrangements," he said. While New Delhi is "unwavering in its commitment to universal, non-discriminatory, verifiable nuclear disarmament," he said, "there is no question of India joining the NPT as a non-nuclear weapon state." 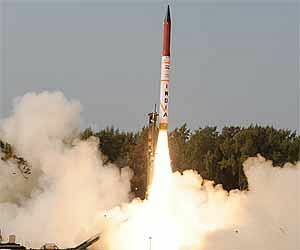 Joining NPT as a non-nuclear weapons state would require India unilaterally giving up its nuclear weapons. India considers NPT as the last vestige of apartheid in the international system, granting as it does to five-countries (US, UK, China, France and Russia) the right to be nuclear-weapons state while denying the same right to others. The NPT came into force in 1970. "India is committed to working with the international community to prevent the proliferation of nuclear weapons and their means of delivery," he said. Varma said nuclear disarmament can be achieved through a step-by-step process underwritten by a universal commitment and an agreed global and non-discriminatory multilateral framework. "We have called for a meaningful dialogue among all states possessing nuclear weapons to build trust and confidence and for reducing the salience of nuclear weapons in international affairs and security doctrines," he said. On another matter affecting the restriction of nuclear weapons, he offered India's qualified support to the Fissile Material Cutoff Treaty (FMCT) negotiations. "Without prejudice to the priority we attach to nuclear disarmament, we support the negotiation in the Conference on Disarmament of an FMCT that meets India's national security interests," he said.